Selby′s secret is that he is the only talking dog in Australia and‚ perhaps‚ the world. With dreams of cosy fireside chats with his owners‚ the Trifles‚ Selby realises his gift could change him forever from family pooch to family servant. Selby′s zany misadventures while struggling to pretend he′s just an ordinary barking dog will have you howling with laughter. 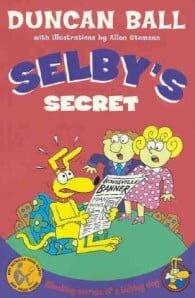 Duncan Ball is an American-born Australian author who has written the children's series Selby (about a talking dog named Selby who tries to keep his secret away from his owners) and Emily Eyefinger (about a girl who has an eye on her finger). He also writes under the name of John St Claire.